Image courtesy of the US Mint. 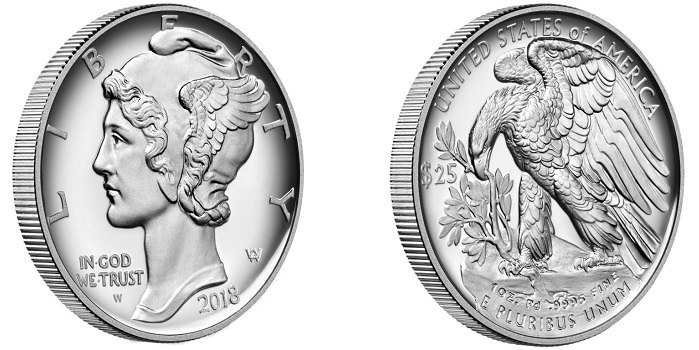 The 2018 high-relief Palladium American Eagle proof coin. The United States Mint is reported to have added a 1oz bullion Palladium coin to its production list for 2019. The mint has produced Palladium coins in proof format for the past two years, with a high relief version issued in September this year. Sales hit 14,782 out of a 15,000 issue limit on Day One alone, suggesting that demand for less common Palladium coins from collectors is there, albeit in limited release quantities. The coins produced so far have been .9995 Palladium and are detailed the same way as other American Eagle coins with the lady Liberty on the obverse and ‘In God We Trust’, as well as a W mint mark for West Point, New York, and the WA initials for Adolph Weinman, the designer.